Thanks for the icons. Great use on a Surface PRO 4, where the icons mysteriously display so tiny. I noticed the 48 color theme has an extra color 48 folder with all the info. Users may want to move all files in the second Color 48 folder to the previous. Then it should work nicely. Am I installing the themes wrong somehow? I used 7z to open the files and then drag them from the 7z interface into the Themes folder, but when I go to Preferences the only available themes are Default and Small? I tried using all 4: Color 32/48 and Symbolic 32/48, none of them appear in my Preferences interface. Edit: Did a system restart, everything showed up and worked perfectly! Thanks for the theme, very helpful! I hated using Gimp on my 4K monitor until I found these themes... Helped immensely. Please, Gimp developers, make it a high priority to allow users to change icon and text sizes (so many programmes suffer from this when used on 4K monitors). However they are thinking ahead, Already in the development version Gimp 2.9.5 there is a scaling icon facility. 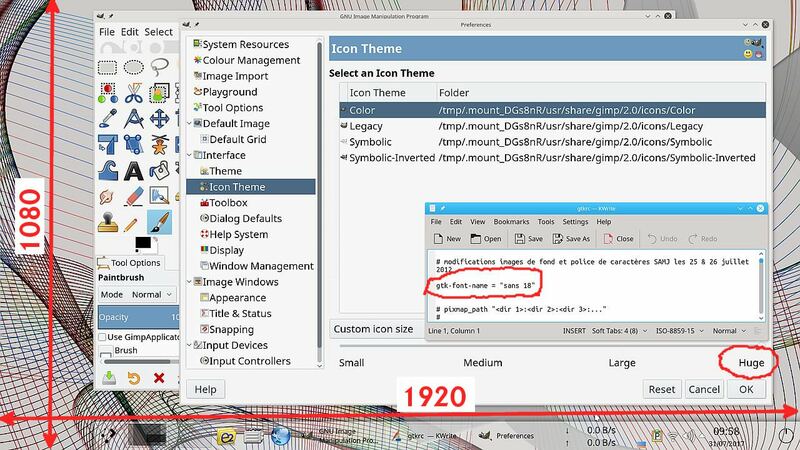 Once 4k monitors become more common I am sure that there will be many dedicated themes for that resolution. Even now, a little tweaking in my usual theme and I can increase font size. I am new to GIMP and I found this thread to be of great assistance! I was encountering a problem and am glad I looked at my install first before aking a stupid question. When I extracted the 7zip file I mistakenly went into the Color_48 folder and copied it's contents to the Themes folder. What I should have done was copy the Color_48 folder in it's entirety. Im just tired I guess. Now all is working s it should, ll i need to do is DL the dark orange theme and we're all set. More information is always better. First check your installation against the following. This is the Gimp themes folder and what the contents of Color-48 should look like. The other themes similar. When (re)starting Gimp In Edit -> Preferences -> Themes should look like this. Remember to Ok the change and restart Gimp for the change to fix. Could someone please go through this step by step? I'm totally lost. How can you select more than one theme when you can only pick one theme at a time? This is truly maddening as I really like Gimp and it's hard to use as it is. Thank you in advance. (11-25-2017, 01:05 AM)SearchKing Wrote: Could someone please go through this step by step? I'm totally lost. You can only have one theme active at a time. Why do you want to select several? OK - I get it, but could someone please post step by step instructions? Do the themes need to be in the same exact folder in GIMP? I've extracted them, and they show up, but don't do anything. I checked the files and they're there in themes, but now what?